Designed in 1951, Model 548 is a study in balance and light, a recurring theme in Gino Sarfatti’s work. Model 548 provides both reflected and diffused light via an adjustable spotlight that is directed upwards towards a coloured diffuser. The large diffuser in methacrylate provides a distinctive dual-effect, combining upward tinted illumination with ample downward reflected light. 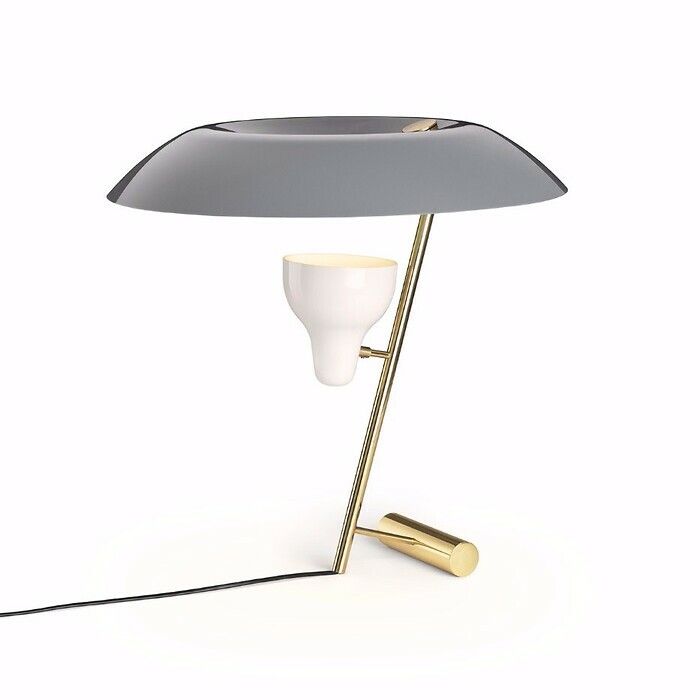 The white painted aluminum spotlight is mounted on a slender tubular stem in polished or dark burnished brass, while a solid brass foot at the base serves as a counterweight; a beautiful balancing act between the individual elements of Model 548. The original incandescent bulb has been replaced by an LED light source controlled by an optical dimmer switch integrated discreetly into the original design. ‘Flos with Sarfatti’ is a collection of luminaires, designed by Gino Sarfatti. A tribute to the grand lighting master who designed over 600 lamps between 1939 and 1973, continuously updating traditional typologies, inventing new functions for light and adopting the latest light sources from fluorescent tubes to the first halogens. Many of these designs appear exceptional contemporary in terms of form, aesthetics and the relationship they establish with the people in the room, emphasizing Gino Sarfatti as one of the greatest Italian lighting designers.